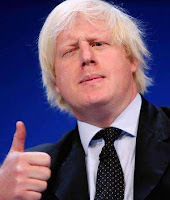 The Mayor of London, Boris Johnson (pictured) who hides his love for bankers and inequality behind a buffoonish, colourful exterior, has been calling for businesses outside London to help pay towards the £11 billion Crossrail ‘super tube’ project. It has worldwide lessons, from a tax perspective. "The City of London Corporation has agreed to make a direct contribution of £200m to the Crossrail project. In addition, the City Corporation will seek contributions from businesses of £150m, and has guaranteed the first £50m of these contributions." "Mass transit in almost every country creates an increase in real estate values along the routes that could actually—the rental increase that’s created by this transportation could actually finance the entire transport system. For instance, in London, when they built the Tube extension to their financial district, they created thirteen billion pounds worth of increased real estate value, and the Tube itself cost only eight billion dollars [sic.]. But they left this thirteen billion of real estate value in the hands of the private landlords. "the delivery of Crossrail will provide a boost of at least £20 billion to the UK economy . . . it will also help secure London’s position as a world leading financial centre." Same thing in Chicago in the United States. There can be a very heavy investment in mass transportation here. This is going to create enormous real estate values. The tax system will leave these in private hands. And I think all of the tax proposals that Mr. Obama has spoken about have to do with income tax, primarily. The rich people prefer not to earn income, because you have to pay taxes on them. They prefer to make capital gains. So the intention of the economic team that Mr. Obama’s brought in is really to create a huge capital gains economy and even more disparity of wealth, while leaving in place the one thing that should have been addressed in the last year, and that’s the enormous debt overhead. Nothing is happening at all on that. He’s adding to debt, not reducing it." And this is why we should be very, very cautious about projects like Crossrail, and think about their long-term consequences in terms of future tax revenues, and distribution of wealth -- beyond the more obvious effects of concentrating investment and people more strongly still around the City area. And it illustrates another set of reasons why it is essential resist the calls of those like the buffoonish Boris Johnson to get the already heavily deprived rest of the country to subsidise a project that is -- while certainly likely to make lives easier for a significant number of the 350,000-odd workers in the City of London, is more fundamentally and more importantly - though more invisibly - about subsidising the wealthiest sections of society. That's one reason why land value taxes are an essential and important part of any good tax system. And that's a reason why tax competition - which has eroded capital gains taxes (which is, to generalise, what wealthy people pay) downwards while leaving income taxes (which is what ordinary people pay) -- is so very pernicious. And why we should resist the bleatings of those who constantly call for lower capital gains taxes in order to stop people and businesses fleeing offshore. It has been shown that when their bluff is called, their clamour is exposed as fraud. People think that taxation is a terribly mundane subject. But what makes it fascinating is that taxation, in reality, is life. If you know the position a person takes on taxes, you can tell their whole philosophy. The tax code, once you get to know it, embodies all the essence of life: greed, politics, power, goodness, charity. Everything's in there. That's why it's so hard to get a simplified tax code. There are a couple of other delicate issues. The first is whether the West - East option is inferior to the North - South in actual transport terms. The second is that there are ways and means of routing and putting together West - East linkages mostly along existing routes that could speed up connections at far less cost. As you suggest, the other is a vast amount of investment capital used to benefit only a small number of people in particular areas that are already at the wealthier end of the social scale. Good to hear you speaking for LVT! Don't forget that if LVT was levied at a decent rate there would be no capital gains to speak of, because these capital gains consist mostly of increases in land value, much of it a speculative value with no existence in reality. If the rental value of land is taxed away, then the whole wretched game becomes history, because land ceases to become an object for speculation. To a large extent this also applies to shares, a substantial proportion of the value of which is land value and the divident rental value of land. As for Crossrail, this really is rather a bad scheme and poor value for money, but that is another story. In reality Boris should have the property owners in the vicinity of the Crossrail and the future riders foot the bill. Apols to physiocrat - TJN deleted a further comment of yours by pressing "reject" instead of "publish.' It was a mistake, sorry. Feel free to re-post. Demetrius - cross-city rail systems can be a disaster as they propagate disruption across networks which would be better kept separate. Thameslink should be a warning. A delay at Haywards Heath can disrupt services in Bedford, and vice versa. It is also impossible to provide suitable rolling stock. Passengers end up making long journeys in trains designed for a ten minute trip. Crossrail should probably be built as a tube line, incorporating the Hammersmith branch of the present Metropolitan Line. It is impossible to define an area within which the benefits of a particular item of infrastructure can be established. There is a gradual fade-off in land value enhancement with increasing distance from nodes such as railway stations. It is also impossible to quantify and attribute the value of the enhancement. The way to capture land value enhancement is through an annual tax on the rental value of land. TJN makes some excellent points in this blog entry! The key message is that effective government investment or spending adds to economic rents, particularly those of land. A school, a road, a park can all impact house prices, showing just how much the market wants (or doesn't want) any particular service. The clearest indication is actually through home rents, since these are not directly subject to credit bubbles and speculation. By calling for Land Value Taxation, TJN is promoting the principle that a taxpayer should be paying for (at least part of) the value of services received. This is the best way to ensure governments and taxpayers interests are aligned, improving the integrity of government itself. Another great thing about Land Value Taxation is that the issue of "domicile", "resident" and "ordinarily resident", as well as the numerous legal "persons" (corporation, partnership, natural person etc) become irrelevant. The owner pays, whatever and wherever they are. If the owner is untraceable, the occupier can pay on their behalf. So much complexity surrounding production taxes (eg on income, profit or sales) is derived from the issue of legal "person" and "residence", and disappears with Land Value Taxes. Perhaps the most interesting effect of Land Value Taxes is the effect on the banking sector. Low taxes on property ownership (like the UK, in practice) result in high market prices. Banks use the high market price to extend secured credit through mortgages, and collect much of the economic rent of land themselves. The natural flow of money is from the productive sector through landownership to bankers. Land Value Taxes are capitalised into house prices, and reduce the income available/needed to pay mortgage repayments to bankers. Overall, LVT reduces natural redistribution to the wealthy - it is a progressive tax (ie narrows the spread of wealth in society). Crossrail is needed because of the concentration of population and consumption in the Southeast. LVT would cut tax bills across the the regions, bringing economic vibrancy beyond the overheated London focus. It would quickly become apparent that much better transport infrastructure projects are available outside London.